Sous Vide (pronounced SOO-VEED) is a French technique for cooking food under water using one of these circulators, at a very precise temperature, without fear of overcooking, resulting in foods that are cooked perfectly every single time - something which can be very difficult to achieve with traditional cooking methods, especially when cooking expensive steaks like the ones I'll be showing you today. We're talking the kind of perfection you find at a fancy French restaurant (which happens to be where the sous vide technique was perfected), only way cheaper and you can do it yourself any time you feel like it. Here's how. Start with 12-inch thick filet mignon steaks, a couple cloves of sliced garlic, and some butter. Note: I purchased a 4-pound whole beef tenderloin at Costco, which was enough to feed my husband and me for 3 meals (plus a little snacking between meals), and it cost less than what we would have spent going out for dinner at a nice steakhouse just once. And I didn't have to worry about over cooking them at all - I knew they were going to be perfect! Back to the steaks, tie them around the equator with kitchen twine to help the super tender meat keep a nice shape. Be careful when doing this - the meat is so tender that you can actually damage it if you pull the twine too tight. Sprinkle liberally with kosher salt and freshly cracked black pepper. Place the prepared filet mignon steaks in a sealable bag with sliced garlic and a pat of butter (amounts listed in the recipe below). Seal the bag, removing as much air as possible. Sous Vide literally translated mean 'under vacuum', and a lot of things cooked via this method are placed in vacuum sealed bags, but the term can be a little misleading because you don't actually have to vacuum seal foods in order to cook sous vide. Any food-safe bag that can be sealed, and can withstand the desired temperature water you plan to submerge it in, can be used so long as you remove as much air as possible. Removing the air is important for two reasons. 1) so the bag will stay submerged (air would make it float), and 2) to reduce the oxygen in the bag which prohibits oxidation and the growth of many kinds of bacteria. Place the container of choice on a heat-proof surface. I used a stockpot, but you can use just about any vessel that will tolerate the temperature water you'll be using. Place the sous vide circulator in a vessel - it should be large enough to hold the circulator and enough water to fully submerge the sealed bag with room for the water to move around. There's a minimum and maximum level indicator on the side of the circulator so fill the vessel with enough water to fall between those two levels. Set the cooking time and temperature you choose. My model is set manually, but you can also get models that can be programmed using an app on your smartphone. I cooked my filet mignon steaks at 138F (medium-rare) for 2 hours, but I could have held them at that temperature for up to 8 hours without worrying about them overcooking. That left me with plenty of time to set the table, arrange the flowers, and make the sides. No stress! A word of caution - the cooking vessel will be filled with very hot water for an extended period of time so be sure to place it on a heat-proof surface and in a safe location away from pets or children. Place the sealed bag in the vessel. You may not need to do this, clipping the bag to the side of the cooking vessel will keep the bag from blocking the circulator's water flow. So what do you do if you need one medium-rare steak and one medium-well steak? Simple - place each steak in its own sealed bag. Cook the first steak at the higher temperature for 2 hours, then reprogram the circulator to the lower temp. When the water reaches the lower temperature, add the 2nd steak. After 2 hours, remove both steaks at the same time. The first steak won't be negatively affected by hanging out in the lower temperature water while the second steak was cooking. Love that! Ok, remove the bag from the hot water when the cooking time is up. You can see the steaks don't really look like they're ready to eat, but we're going to fix that. Heat a skillet until it's screaming hot. I like to use cast iron for this. Add a drizzle of oil and a good pat of butter. Remove the steaks from the bag. Pat them dry and remove any bits of garlic. Reserve the garlic slices and any juices that have collected in the bag. Add the steaks to the screaming hot skillet and let them sear on each side for 30-60 seconds per side. Oh my - I wish you could smell my house right now! Once the steaks have seared, place them on a plate to rest. You can make a quick pan sauce by adding the reserved garlic and juices from the sous vide bag to the hot skillet. Stir and scrape up any seared bits from the pan and let the mixture bubble away and reduce for a minute or two, then turn off the heat and swirl in a pat butter. Seriously, just look at that, will you? It's not gray around the edges and raw in the center. It's cooked to absolute perfection - the entire thing - from one side to the other - perfect. You'd never ever be able to achieve that in a skillet or on the grill. Heck, I've worked with professional chefs who can't cook a steak that well. And the flavor? Forghettaboutit - absolutely perfect in every single way you can imagine. Super tender, juicy, buttery, garlicky, and absolutely luscious... in a word, phenomenal. I kind of wish I could share this with you, but that would mean less for me so let's just say I hope you'll get a sous vide circulator and give it a try. I promise, you won't be disappointed. And be sure to check back because I'll be posting a lot of sous vide recipes in the future -savory and sweet things. I can't wait! Prepare filets by tying each around the equator with kitchen twine, being careful to not wrap it too tightly which could rip through the tender meat. Evenly sprinkle the kosher salt and freshly cracked black pepper on both sides of the filets. Place filets, 1 tablespoon of butter, and sliced garlic in a sous vide or heavy duty zipper bag, being sure to remove as much air as possible before sealing. Place sous vide circulator in a vessel and fill with water according to manufacturer's directions; set temperature and cooking time (I set mine for 138F for 2 hours - use temperature guide decide how you'd like your filets cooked). Place sealed bag in water, being sure bag is fully submerged and clip bag to side of container to keep it from blocking the circulator pump. When the sous vide time is done, remove sealed bag from water. Preheat cast iron skillet over high heat until very hot. 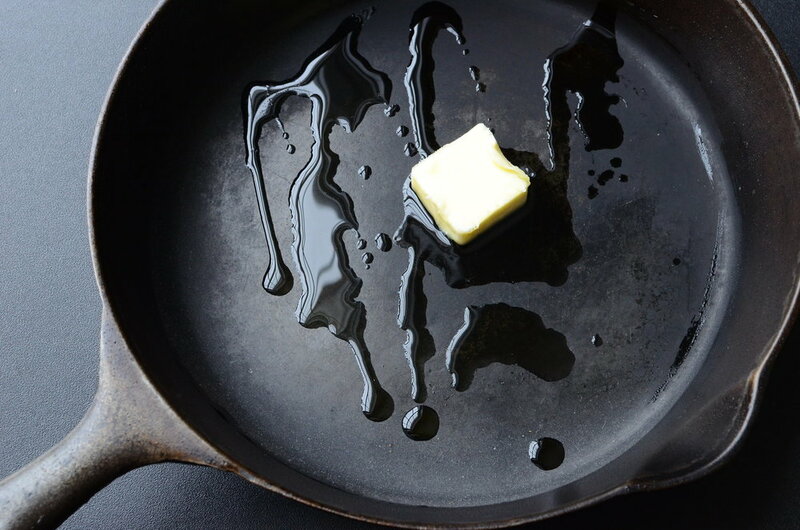 Add remaining 2 tablespoons unsalted butter to the skillet and sear filets for 30-60 seconds on each side; remove to a platter. Immediately pour the juices from the sous vide bag into the hot skillet and whisk for about 1 minute; add the remaining butter and whisk until melted, then pour over steaks and enjoy! The weather is going to be beautiful this weekend and I can't wait to sink my teeth into this fantastic marinated skirt steak. This marinade is so tasty, my mouth is watering just thinking about it. Feel free to substitute flap steak or hanger steak if you like. My favorite way to eat these paper thin flavor bombs is on top of a tossed green salad, but they're great in tacos and fajitas, and I've even been known to snack on them cold right out of the fridge. Enjoy! You can use skirt steak, flap steak, or hanger steak for this recipe. They're all fantastic. To make the the marinade, you'll need worcestershire sauce, balsamic vinegar, canola oil, salt, pepper, a clove a garlic, a scallion, and McCormick Hamburger seasoning (magic stuff!). Combine the marinade ingredients together in a small food processor. Blitz, blitz, blitz. Reserve 2 tablespoons of the marinade and chill. This will be used as sauce later. Put the trimmed steak in a large zip-top bag and pour in the remaining marinade. Close the bag and massage the marinade so all the meat gets coated. Refrigerate the marinating meat for 4-24 hours, tossing every now and then if you think about it. Grill for 2-4 minutes per side. Here's I cooked them on a griddle, but sometimes we cook them on the grill outside. Slice very thin across the grain. Toss with pan drippings and/or the 2 tablespoons of reserved sauce. Enjoy! Trim skirt steak of excess fat or silver skin. Cut steaks, in the direction of the grain, into approximately 4-inch wide pieces; place in a gallon-size zip top bag. Make marinade by processing the remaining ingredients in a blender or food processor; reserving 2 tablespoons of the marinade to serve as a sauce. Pour remaining marinade over steaks in zip top bag; seal bag well and knead to make sure the marinade reaches all surfaces of the meat; chill for 4 to 24 hours (tossing every few hours). Chill the reserved 2 tablespoons of marinade separately. Remove steaks from marinade and dry with paper towels. Preheat grill (or cast iron pan on the stove top); cook steaks for 2-4 minutes per side. Allow steaks to rest for 5-10 minutes before slicing thinly across the grain. Toss with reserved marinade and serve. Makes 4 servings. Note: if cooking on the stove top, remove steaks and deglaze pan with 1/4 cup water and reserved marinade; cook until mixture reduces by half, then pour over sliced steaks and serve.